The Bugaboo Fox Stellar is the first special edition of the Bugaboo Fox, which was just launched earlier this year. 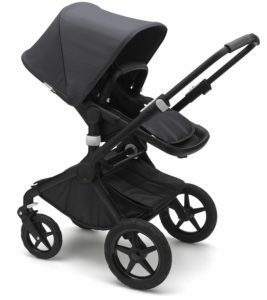 It’s the ultimate comfort stroller with added safety feature of visibility in the dark. The stroller features midnight blue fabric with reflective logo and zippers. It also has reflective material on the wheel caps and the front and rear of the chassis. It has nighttime visibility from up to 150m away to ensure you and your baby are safely seen when the sun starts to set. Next up I have Mochi Teething Necklaces and they are a favorite among safety- and environmentally-conscious parents. 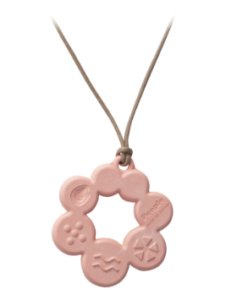 Unlike most teethers that are made from silicone or plastics, Mochi Teething Necklaces are made from rice in Japan. 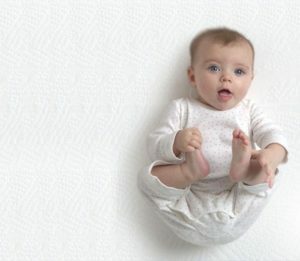 The rice gives it a unique teething texture that babies love and it also gives parents the peace of mind knowing they are made from a natural material. The necklaces have a pull-away clasp so if baby pulls it too hard while it’s around mom’s neck, it will snap right off. LILLEbaby is a baby carrier intentionally designed with safety in mind. They recently announced a new line of carriers called the Active Series. 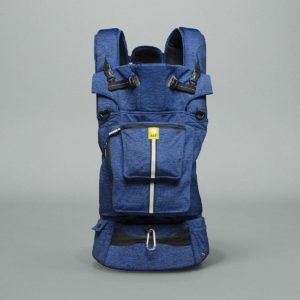 The two new carriers, Active All Seasons and Active Pro, feature brand new enhanced babywearing technology and advanced ergonomic fit for spine safety. Best of all, the carriers include reflectors on the front and back allowing for safe babywearing walks at dusk or after dark. The material is incredibly soft and the carriers feature 7 pockets for maximum storage. 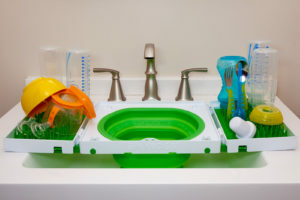 The CDC recently released new guidelines for washing infant feeding supplies and breast pump equipment which states that these items should never be placed directly in any sink when being cleaned due to the risk of a contaminated sink basin. That’s why Sinkboss was invented. It’s a portable solution for washing and drying baby bottles, pacifiers, pump parts and more when you’re on-the-go. It’s great to use while traveling at hotels, campgrounds, the office, or even at home. It’s the safest way to wash your baby supplies.